Aerobic organisms are thus critically dependent upon a steady supply of O2 to maintain metabolic homeostasis. This has led to the evolution of highly complex biochemical mechanisms to sense and respond to variations in O2 availability. In 2016, the Albert Lasker Basic Medical Research Award recognized three physician-scientists (William G. Kaelin, Peter J. Ratcliffe, and Gregg L. Semenza) for their elegant and painstaking work describing how Hypoxia-Inducible Factor (HIF) protein complexes enable cells to sense and respond to changes in physiological O2 levels. 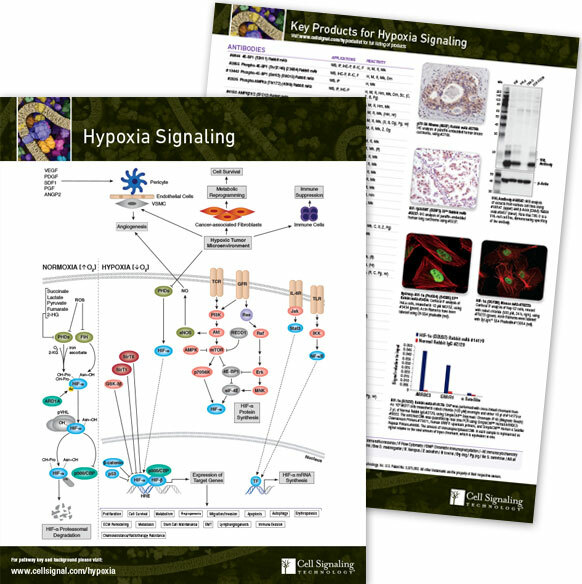 The HIF-1 complex is now widely recognized as a master regulator of the response to hypoxia (low oxygen levels). 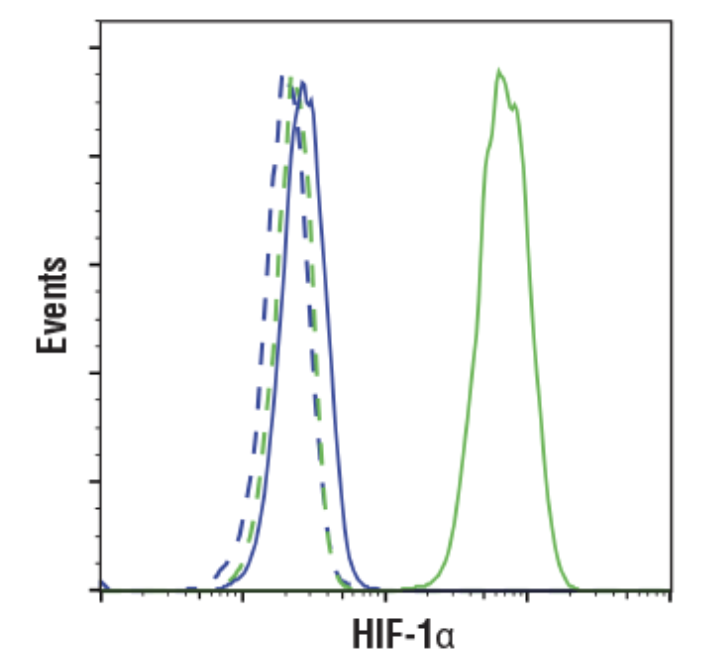 HIF-1 is a heterodimeric transcription factor complex, composed of two subunits: an O2-responsive HIF-1α subunit, and a constitutively expressed HIF-1β subunit. The intact HIF-1 complex binds to hypoxia response elements (HREs) in the promoters of genes that govern diverse processes, such metabolism, proliferation, apoptosis, and angiogenesis. In the presence of normal O2 levels (normoxia), HIF-1 target genes are turned off. Mechanistically, cellular oxygen levels are sensed by prolyl 4-hydroxylase domain proteins (PHDs), which respond to the presence of oxygen by hydroxylating the HIF-1α subunit on (specific) proline residues. 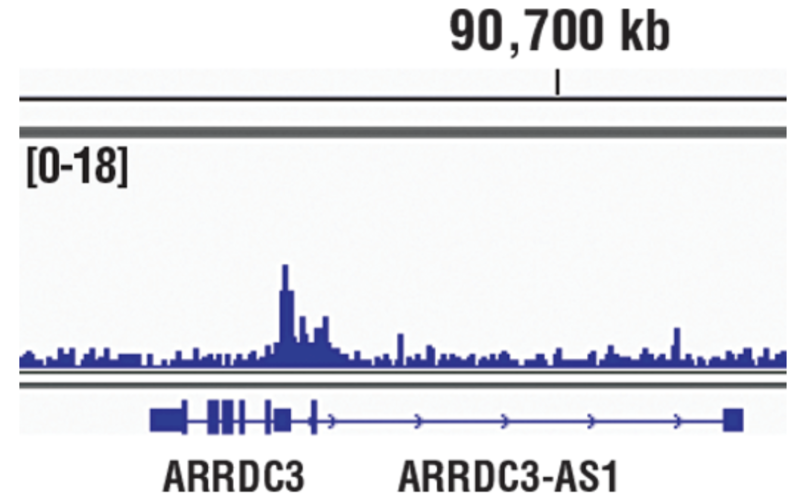 This promotes its binding to von Hippel–Lindau tumor suppressor (pVHL), which serves as the substrate recognition component of an E3 ubiquitin ligase complex. Binding of HIF-1α to pVHL thus mediates the ubiquitination and proteasomal degradation of HIF-1α. During hypoxia, reduced oxygen availability leads to a decrease in prolyl hydroxylation of HIF-1α by PHD proteins. Non hydroxylated HIF-1α is more stable that hydroxylated HIF-1α, resulting in increased expression of the protein which can then interact with HIF-1b and promote transcription of HIF-1 target genes. Numerous studies have shown that cells within oncogenic lesions can influence cellular HIF-1α levels by bypassing normal HIF-1α regulation. For example, in clear cell renal carcinoma, a functional loss of pVHL was shown to suppress O2-dependent HIF-1α degradation, leading to increased HIF-1α transcriptional activity. Mutations that activate receptor tyrosine kinases, such as EGFR and HER2, have also been observed to increase HIF-1α mRNA translation, mediated in part by increased PI3K/Akt pathway activation. Tumor architecture can also contribute to HIF-1α activation, when the metabolic demands of rapid tumor growth outpace the limits of vascular supply. This scenario creates hypoxic microenvironments within and around the tumor cell mass, which results in HIF-1 activation. 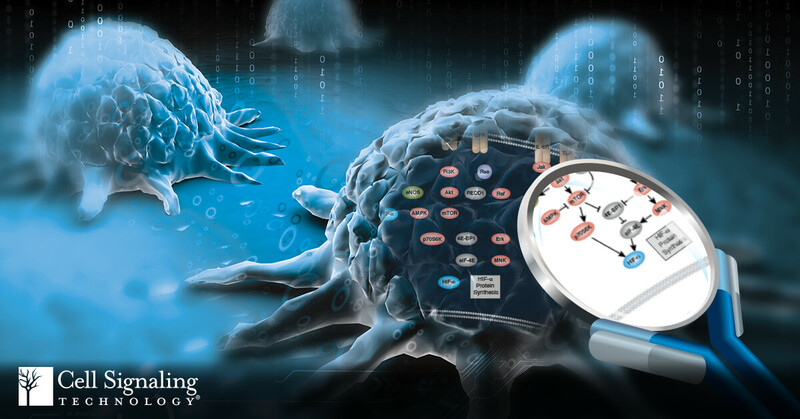 HIF-1 activation has also been shown to lead to metabolic reprogramming that indirectly promotes cancer progression, and more recently, research studies have implicated the HIF-1 pathway in cancer immunity1,2. For instance, HIF-1α activation in CD8+ T cells was shown to be essential for lymphocytes to infiltrate solid tumors. HIF-1 also seems to participate in vasculature formation by synergistic correlations with other proangiogenic factors such as Vascular Endothelial Growth Factor (VEGF). Conversely, there is evidence to suggest HIF-1 signaling may contribute to the immunosuppressive tumor microenvironment, underscoring the complexity of its role in cancer biology. This remarkable complexity has led to several tantalizing hypotheses. For example, does hypoxia within the tumor microenvironment represent a vulnerability that can be exploited to treat tumors? If so, how can HIF-1α be manipulated in the tumor microenvironment to achieve maximum anti-cancer efficacy? Further basic, translational, and clinical studies are underway and will hopefully address these and other outstanding questions, and advance our understanding of how HIF-1 contributes to cancer and other diseases. (1) Curr Opin Genet Dev. 2010 Feb;20(1):51-6. doi: 10.1016/j.gde.2009.10.009. (2) Cancer Cell. 2017 Nov 13;32(5):669-683.e5. doi: 10.1016/j.ccell.2017.10.003. Are you conducting HIF-1α research? 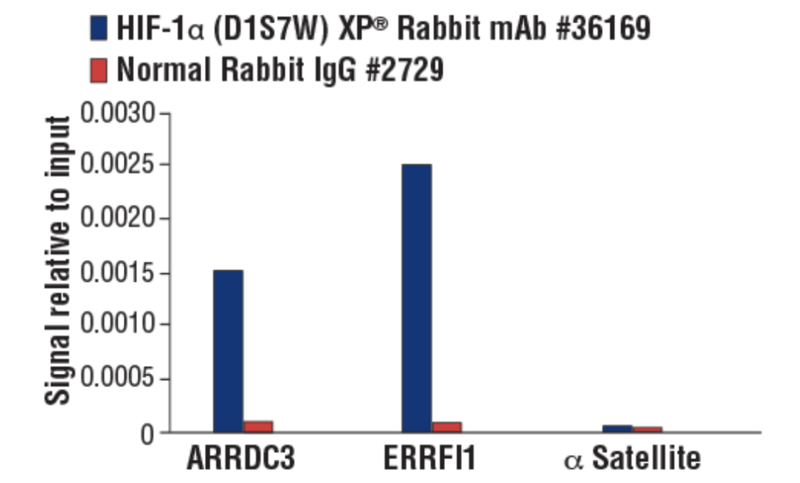 To facilitate the progress of basic and translational cancer research focusing on the hypoxia connection, we have recently developed a new rabbit monoclonal antibody --- HIF-1α (D1S7W) XP® Rabbit mAb #36169. 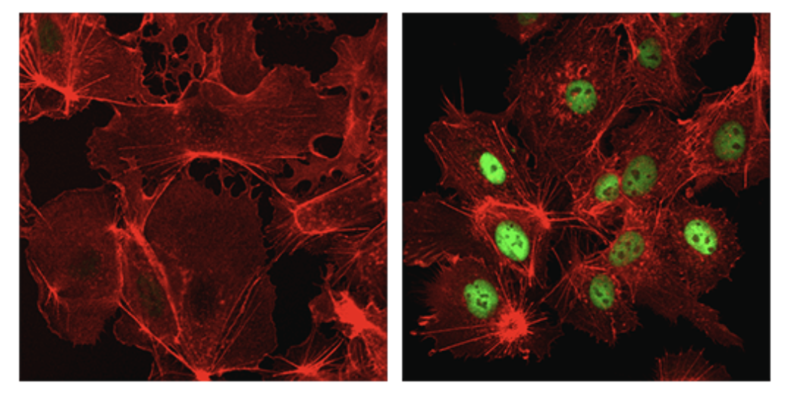 This antibody detects HIF-1α expression in adherent cells (by immunofluorescence) and in suspension cells (by flow cytometry). Researchers can also use it in ChIP and ChIP-seq experiments to study HIF-1 regulatory elements and screen for HIF-1α binding sites in the whole genome. These efforts will lead to further insights on how HIF-1α regulates its target genes under various biological conditions.